Our family used to go through a lot of shampoo and conditioner. After looking at the ingredient list on the back of the bottles (and really thinking it over) I decided to do my best to make a shampoo that would clean my hair sufficiently and not weigh it down. Over the years I tried a lot of different recipes. I was never happy with the outcome and eventually gave up. Once my daughter, Therese, took over making the family soap she looked at the ingredients on the back of the shampoo bottle and started researching the ingredients, particularly sulfates. She researched so much that she wrote a blog post about all the harmful side effects it has and how it is in so many of our health and beauty products. 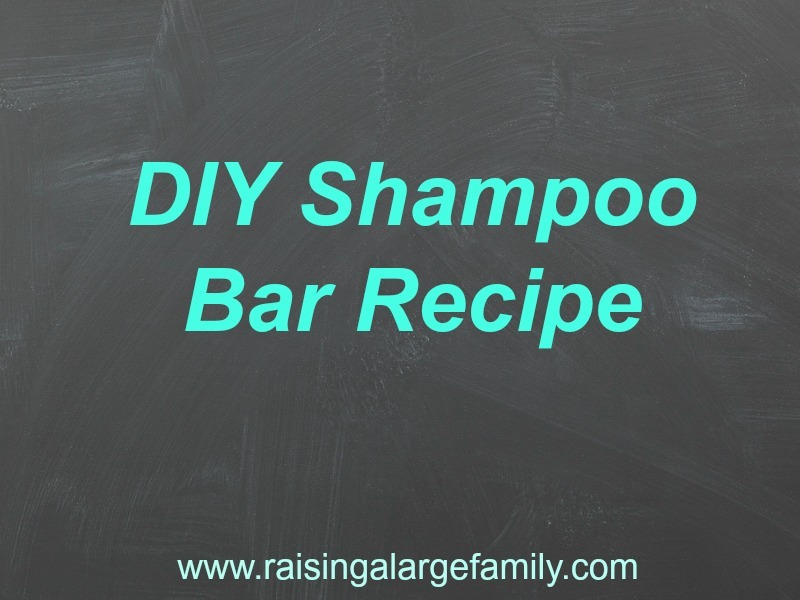 This enticed her to try various shampoo (liquid and bar) recipes. Our favorite recipe is the coconut oil shampoo bar. I love how it makes my hair feel. However, I have to shampoo my hair a little differently than I used to, just to warn those of you that have fine, lightweight hair. First, I soap up my hands and rub it all throughout my hair. Then, I soap up my hands again and then rub my fingers all throughout my hair’s roots. I then let it sit in my hair a little bit while I soap up my body. This helps break down the oils in my hair. Then I thoroughly rinse my hair until it feels squeaky. I have noticed that after about a week of using the shampoo my hair feels like it has build up on it. The way to get rid of this is to use a apple cider vinegar rinse on my hair. I use a condiment bottle and put 2 tablespoons apple cider vinegar in it and fill it up with water. I then distribute it throughout my hair (not necessarily the whole bottle, just the amount I need to saturate my hair) and let it sit while I brush my teeth. I then rinse it out completely. This seems to take care of the problem for me. If you find your hair becomes a little dry feeling you can put a TINY bit of coconut oil in your hands and distribute it through your hair, particularly on the ends. I can’t emphasize enough though how tiny of an amount I mean. You will feel like you’re putting nothing on your hair, but trust me, you are. Measure out your oils carefully, and place on the stove over a low heat. You want just enough heat to where you’re slowly melting the oils, but not enough to where the oil is heated to a boil. If you’re going to use an essential or fragrance oil, then measure that out as well and set aside. Wearing proper safety equipment, measure out the lye. Once done, set aside in a safe place while you measure out the water. Once both are measured out, take the lye and pour very slowly into the water, all the while stirring briskly (not so brisk that the lye solution might splash). Before mixing it together with the oils, it will need to be cooled down to around 100 degrees, so set aside in a safe place. If you are feeling ambitious (I usually do this actually), then fill the kitchen sink with about 2 inches or so of water, and place the lye solution container in it. Will cool off a lot faster! When your oils and lye solution have both cooled off to around 100 degrees, it’s time. Pour the lye solution very slowly into the oils, all the while stirring thoroughly and briskly. Once you begin seeing signs of the trace (check out the link if you’re uncertain of ‘the trace’ is), you can pour in the fragrance or essential oil of your choice. Mix this thoroughly together till you see absolutely no sign of the additional oil, and it looks like plain old un-cured soap. Pour into your already prepared molds. Once this is done, just smooth over the top and set aside! Let sit for roughly two days, but since this is a smaller batch I would advise to watch it as it will set a bit faster than a normal sized batch. You could probably get away with just one day. Once your one to two days is up, pop out of the molds and cut. Let cure for two to three additional weeks before use. This recipe came from www.victorianbeauty.net, my daughter Therese’s website. If you’d like to see the original post you can read it here on her blog.